Why did I read this book: Awesome under-the-sea dystopia premise. Enough said. Sixteen-year-old Evelyn Winters’ life is just about perfect. Adopted by Mother and made the Daughter of the People, Evelyn is being groomed for the inevitable day that she will take over Mother’s illustrious position as the head of the suboceanic society of Elysium. The war and strife of the hateful Surface Dwellers above led Mother to start a new society of her own, concealed by the ocean’s murky depths. It is Evelyn’s job to listen to the people, to learn from Mother, and most pressingly, to select a mate with whom she will Couple – from the predetermined pool of matches that Mother has authorized, of course. When a surface dweller makes his way into Elysium, however, everything Evelyn has ever known changes. Gavin – the young, handsome, and impossible Surface Dweller – causes Evelyn to question her society, her own mind, and Mother. As she grows closer to Gavin and decides to help him escape Elysium, she uncovers devastating revelations about Elysium’s past, Mother’s true nature, and Evelyn’s own clouded, brainwashed past. I was drawn to Renegade because of the killer premise for the book – I love a suboceanic SF tale, and I love dystopian societies with unreliable narrators even more. 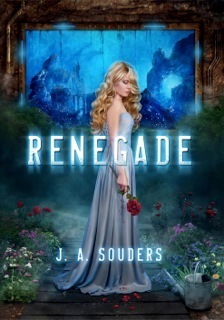 When I started Renegade, it truly seemed that the book would deliver on this incredibly promising premise – it has a cool sort of Bioshock-ish vibe, combined with a distinct sense of foreboding creepiness, as Renegade‘s heroine is completely unsuspecting that her actions and thoughts are so bizarre. Evelyn’s brainwashed, repetitive thoughts and the little pieces of information she lets slip about her daily life are unsettling and effective in painting a picture of a deep-seated wrongness in Elysium. So, yes, Renegade starts with an undeniable bang. That said, while the first chapters are solid, the book quickly devolves into a puddle of tepid ridiculousness: Renegade is a classic case of great idea, terrible execution. A poorly conceived world that is blandly written with a nonexistent plot and laughable characterizations, Renegade is not a good book. Let’s start with the (nonexistent) plot. From the description and the first few chapters, you’d think the book will be a girl’s journey to uncover the secrets of her past and come to terms with the conditioning and brainwashing she has had to endure for years. It isn’t. Essentially, the plot of Renegade involves Evelyn and Gavin running around Elysium for the entire book, desperately looking for escape exits and dodging DNA-scanning guns (it’s ok because apparently Elysium has no shortage of “shadows” in which Evelyn and Gavin can hide from guards and gun turrets). While fast-paced, the lack of actual meat and emotional integrity to the story is deeply disappointing. Instead of character development and realistic motivations for character decisions and action, we get slipshod worldbuilding (replete with ludicrous technology – more on that in a bit), people that are EVIL for EVIL’s sake, some good old fashioned insta-love, and a dystopian society that inherently makes no sense. [Mother] grew to hate free will. She believed she had a pure vision of a perfect society – a perfect family – but the Citizens did not comply. She saw the city falling apart before her eyes. The harder she worked to bring her vision to the city, the more the people rebelled against her rules. She wanted them to be more docile so she worked with a scientist to experiment with gene manipulation. And with that brilliant observation, Mother’s character is explained away by Evelyn. Case closed! She grew to hate free will! That explains everything! Then I reach another section in code. I can’t make out much, but the dates correspond with the journal from Sector One. Finally, I find a blue hyperlink within the code and I know I have to see where it leads. The computer immediately asks for a password. At fist I panic […] But still, I barely breathe while I fight the computer. My fingers fly over the holographic keyboard ad my arm aches like a bad tooth, but I don’t dare stop. Even though I’ve never done this before, it’s like the codes an sequences are all there in my mind just waiting for me to use them. Somehow I know how to peel down each wall of security as if it is an orange […] with every step I take forward to break the code, the more concerned I am the computer will tell Mother what I’m doing. Finally, just as another drop of sweat dribbles down my back, the desktop appears on the holoscreen. I cracked the password. But there’s more! Beyond the ludicrous computer information technology, more importantly there are fantastically convenient devices and nuggets to bail Evelyn and Gavin out of trouble, and also to cause drama to make sure they don’t make it to the ever-illusive exits too quickly. There are conveniently left behind and perfectly preserved notebooks detailing Mother’s past (from both Mother’s perspective, and that of her unfortunate father), and there are caches of weapons from decades earlier that were never removed or discovered in a secretly preserved older sector in Elysium that Evelyn and Gavin just happen to stumble upon. There’s a poor wee little lamby…The bees and the butterflies picking at its eyes. And then, of course, there’s the problem of the insta-romance – Gavin and Evelyn know each other for, oh, 3-4 days, and Evelyn is willing to throw away everything she has worked for as Daughter of the People, and she can miraculously overcome the ingrained conditioning and brainwashing that has dominated her life since she was a child. Needless to say, things feel a little rushed, and the character development is stunningly unconvincing. Compounding the problem is Souders’ writing, which ranges from blandly competent to intensely annoying – stomach flutters, breath catches, and phrases like “I lose myself along with my breath and my heart” abound. There’s also the problem that Evelyn and her friends are so very ridiculously STUPID and slow to put together the pieces (e.g. when friends start acting strangely and issuing weird canned responses – He’s a Filthy SURFACE DWELLER! You are Silly Flighty Girl! – the thought of brainwashing never crosses her mind). I could keep going on. I really could. But I think you get the picture. So far as Renegade is concerned, there’s only one word that comes to mind to embody my dissatisfaction with the book. Just NO. Every morning Mother has the Maids wake me at precisely ten. Then it’s time for a light breakfast followed by a mandatory visit with my Therapist. It’s nice to have someone to talk with. After, I am free to do as I wish until it’s time to perform one of the duties Mother has requested of me. This morning I sit in my garden, quietly doing my cross-stitching. the garden is so peaceful in the morning, especially when the sea life outside the glass dome passes by. The Surface could never compare. Not that I’ve ever seen the Surface. It is forbidden, even for me. Which is fine. My life is just about perfect. At first I was going to Call You Out for all the Random Capitalization in your Review, but then I read the Excerpt and Realized that it isn’t you, it’s in the Text. Meanwhile, will pseudo-science fiction authors please give up the insanely stupid “genetically perfect” trope? I am not a professional geneticist, but even a good high school science education is enough to make my head hurt with the meaninglessness of the concept. See, Thea, that’s why I think you should read And All the Stars, too. So you can get this taste out of your reading brain and enjoy an apocalypse without dystopia and with people of all kinds of sexual persuasions able to work and love together. And there’s Bechdel Test passing, as well. And POC. A question! As a burgeoning teen writer, I wanted to ask: How would you fix some of the problems in this book? Like the convenient storytelling devices (boring ways of giving the audience info about characters ie diaries) and the logic problems? READ ONLY MEANS SHE CAN READ IT. EVERYONE CAN READ IT. THE CLUE IS IN THE NAME. ARGGGGHHHHH. So, uh, yeah, definitely skipping this one. This book is in my TBR pile at the moment. This review makes me apprehensive about reading the book. I’m thinking it going to stay in the TBR pile for a bit longer. Aww shugs, I’m just reading that book – and I’m really, really in love with the cover of the German version. I thought she had a for the first hundred+ pages a compelling enough idea to make me overlook her terrible use of present tense (really, she should read “The Night Circus” to see how it’s done properly), but now it’s developing into a teen romance novel – and not the good kind of, I see no chemistry between her lead characters. Too bad, I really had hoped to enjoy it at least close to how I enjoyed reading Kat Falls’s “Dark Life” novels. Whoa. Must be PRETTY bad. That’s too bad, has a pretty good premise. Waste of a good idea. I agree with your review of this book. But I have some answers for your questions. Mother is basically Hitler that is how she gained power (that’s as much as the book tells you) and there are only people with blonde hair blue eyes because she killed everyone who wasn’t before the started “breeding”.